I've got just a little over an hour to get in the car and drive to the airport. You'd think that I would finish packing...and I will, but after this blog post. You gotta have priorities! Comic-Con preview night starts in just a few short hours, and I'm happy that I'll be attending once again. If you're able to make it out, look for me doing two things - aimlessly wandering through the jungle of displays, and doing a little bit of signing at the New England Comics booth. What's the booth number? It's...something in the 2000s. Near the DC booth. Whatever, look it up! I'm sure it'll be a fun time. Look for lots (and lots and lots) of pictures here over the next few weeks. Any time Marvel releases any kind of special "theme" comic, I always wonder how long it'll be before they include the Fantastic Four in on the trend. This is true for the 2099 line, the "The End" specials, the "Noir" specials, etc. And while I always feel cheated if they don't come up with some version featuring the FF, a little voice speaks up in the back of my head and says, "hey, at least you didn't have to pay for anything new." It's with this sense of duality that I always viewed IDW's "Artist Edition" oversized books: they look really cool, but they also come with a hefty price tag. Artist Editions take a specific writer/artist's run on a particular book and reproduce the artwork in an oversized format, scanning in the black and white production artwork from the original pages, complete with any production notes and stray marks that wouldn't make it into the final product. It creates a fairly unique experience and has been a success for IDW, so much so that they've released several editions of the series, each reprinting a classic Marvel collection (why Marvel licenses these out and doesn't just create them themselves is anyone's guess), such as Walter Simonson's Thor and Frank Miller's Daredevil. A little while ago, I found out that selections from John Byrne's lengthy Fantastic Four run were getting the Artist Edition treatment, and I was faced with the conundrum of wanting to see the Fantastic Four get their due but not wanting to shell out too much cash all the time (I can't imagine what it's like for the big-time Batman fans who feel the need to buy up a lot of new releases). Artist Editions often sell out fairly quickly, and from what I understand, IDW only does one print run. So I made the decision to pre-order the book, and it arrived in the mail just a few days ago. The box even has a picture of the book printed on it! In case you were wondering about the scale of the book, here's some reference. No, I haven't shrunk down to minuscule proportions (at least I don't think so)...the book is really very hefty. It's nice and solid and is pretty classy. The back cover features this iconic image with a reproduction of Byrne's signature. Printed on the interior front and back covers are Byrne's Fantastic Four character sheets. These are the first things that the reader sees once he or she opens up the cover, and it gives you some idea of the scope you're in store for. My wife remarked on how cool the image was, and wondered how much it'd take to own the original artwork. I got a better feel for the answer a little while ago when I watched this eBay commission of the Thing and Dr. Doom by Byrne go for a whopping $800. If something like that would go for so much, a really desirable piece like the one reproduced above would go for, what, $5000? It's hard to imagine. The book reproduces pages from a handful of Fantastic Four issues plus one issue of What If...? (starring the FF, written and drawn by Byrne). As expected, IDW did a wonderful job with this collection, capturing the production aspects of pages that were created around 30 years ago. All of the pages in this edition, with the exception of four, were scanned in from the existing originals for this collection. That's quite a feat, considering how much time has passed since the artwork was actually drawn, and even more so due to the fact that, if I'm correct in my assumption, Byrne had sold most of the original pages from the issues in question. I say this because Byrne's signature is on a good deal of the original pages, and that usually indicates that the artist parted with the pages, for whatever reason, and signed them before sending them on their way. I wonder if most of these pages are owned by a single person, or if IDW had to track down a few dozen collectors to see if they could borrow their investments for a while. The back of the book held a few goodies, including a cover gallery with this great image featuring the Thing! There was no hint of She-Hulk anywhere, though, which was surprising considering how prominent a character she was in Byrne's FF run. And I wouldn't have minded a page or two from the Thing series that Byrne spearheaded for a little while. Overall, though, this collection was well worth the cost. I understand that it's not for everyone, but for me, it's something that I'm going to enjoy for a good long time. If you're a big Fantastic Four fan, and you've got a little money to spend, I highly recommend this Artist Edition. In case anyone was wondering, the Tick property has had its share of popularity in its day, much of it surrounding the mid-'90s Fox Kids cartoon. The show was a high-water mark for the character's level of recognition, and in addition to that, there was a lot of Tick merchandise created at the time. Case in point, there was an entire party set made for the show, and I was able to get my hands on a complete set of party items recently. Bucking my usual collector's mentality, we decided to have a party and use all of the props that I had bought. These things were made for a 14-year-old's birthday party, but I saw no reason to let that stop us. The occasion for the party was the Free Comic Book Day issue of the Tick that I wrote, and my continuing relationship with the Tick and New England Comics (hooray). My wife had originally planned to throw the party in May, closer to the release of the issue, but it kept getting pushed back and hey, it's July. But no worries. At the very top you'll see the Tick party topper, which is at least three times as fun as it looks. It's interesting (but not surprising) to note that all of this merchandise featured, pretty prominently, the Fox Kids logo. Let's take a look at some of the other things included in the party pack! Plates! You can see American Maid in the top left corner - she was the only character other than the Tick and Arthur to be featured on any of these items. I wonder if that's because she was one of the few female characters, if she fit the color scheme, or if it was just a random choice. Here's the paper tablecloth. "Keen" and "Spoon" are obvious phrases to include on some things like this, but the other caption (Arthur is saying it on the cups) is a bit more strange. "We will protect and defend each other from now on until the end of time!" As far as I know, that's not a line from the cartoon, and it seems altogether pretty generic. And we can see another American Maid appearance on this tablecloth. It wasn't my birthday...but why not? There are only so many Tick-themed party decorations. Some of the detail. You can see the copyright of 1995 here. There was lots of food to be had at the party, as I made corn on the cob, hot dogs, fried chicken, baked beans, cornbread...and other stuff. We decided that it would have taken too much effort to cut the hot dogs into little octopi. It's not a party without a Dairy Queen ice cream cake. With blue icing! It kind of looks like the Tick is eating a huge piece here. I promise that there were other people in attendance than myself and three-year-olds. My nephew couldn't figure out whose birthday it was, but he ate the cake nonetheless. ...or the invitation/thank you cards. But they're there, too. I felt like this should have been a roller skating party. It certainly did take me back. I had a great time, and it certainly feels good to celebrate something like getting to write the Tick. I love Superman. I hate Superman!! To be fair, Superman means different things to different people, and it seems that every generation has a new take on the character. 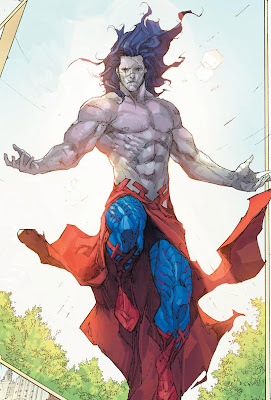 Superman as a concept is strong enough to withstand those revisions while still retaining the essence of what makes him a character for the ages - a strong moral background, a willingness to stand up for what's right, and a longing for equality. The 1940s and '50s were the heyday of the "father figure" Superman, who at times could be pretty condescending and narcissistic, but nevertheless lived up to the larger ideals that we know him for today. A great example of this is in the promotional image seen above. It's a public service announcement that, when taken in the context of the time, is pretty profound, and it represents, to me, what Superman is all about. Here we are in a time when minorities of all types are, at best, second-class citizens, and Superman steps up to remind us all about our social responsibilities, showcasing the promise and potential of America. The message still resonates today! What a powerful message, and what a character to stand up for what's right. 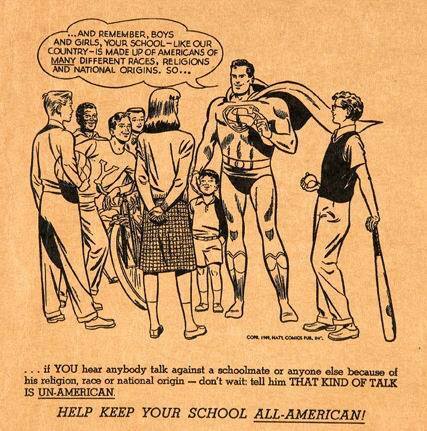 I love patriotic, inclusive Superman! Superman, along with the rest of the DC universe, underwent a fairly well-covered reboot in 2011. While there have been some bright spots, the results have been, for the most part, pretty terrible, and Superman can't escape the mess that has become DC Comics in recent months. This has nothing to do with the character himself, but rather how he's been written in his self-titled "Superman" book. If ever there has been a ship lost at sea, it's been the Superman title, and it doesn't seem to be getting any better any time soon. I realize that Superman has been through some rough patches before, and his high commercial status often supersedes the desire to tell challenging stories. Just before the reboot, there was a horrendous "Superman walks across America for no reason" story that was the epitome of boring, for example. But this current run rivals or surpasses even that. A great example of what I'm talking about is the character "H'El" (OH, I GET IT!! HOW CLEVER!!! ), as seen above, who looks like he got hot and decided to wear his shirt tied around his waist, and who was brought out like some weird, brooding, Edward Cullen-type character who felt things and stuff. Nothing could prepare me, though, for a recent issue, which made me want to jump out of my skin. I took a picture of the panel in question, and I've stared at it incredulously a few times since. Listen, DC, I can put up with a lot when it comes to comics. I've read some terrible stories in my time, and for some reason I stick with it when it comes to characters I love. But this -- THIS! -- drives me nuts. "You have no idea what it is your carrying around inside your head." What it is "YOUR" carrying around? Did I just read the most anger-inducing grammatical error of all time? No one at DC knows the difference between "your" and "you're"? Really? REALLY?